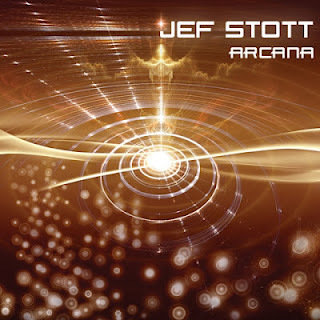 Jef Stott’s new album Arcana invites listeners to follow a strong, snaking bass line to a place of skillfully balanced power and peace. A female voice mingles with a buzzing bass line for a few moments and then crescendos through and above it on “Deep Playa,” the opening track of Arcana, San Francisco-based musician Jef Stott’s latest album. Throughout the entire recording, Stott merges vocals and acoustic instrumentals—at once ageless- and ancient-sounding—with electronic beats and percussion loops. He pairs the future with the past and strength with sensitivity, revisiting many previous collaborations along the way. Stott, who has been releasing albums since the late 1990s, never completely stepped away from music while pursuing a career path in a different direction and a master’s degree in interactive media. But Arcana represents his renewed focus on music after life dealt him a series of blows, and symbolizes his coming back to the beginning and re-gathering strength. Arcana draws on Stott’s years of expertise in Middle Eastern music, including studying with oud virtuoso Hamza El Din, and on his success as a DJ at festivals like Burning Man. But at the album’s heart is actually a much earlier and simpler musical experience. Stott built upon this six-string foundation with lush, synthesized sounds and with skillful juxtapositions and looped recordings of talented friends like singer MC Rai, tabla player Jason McKenzie, and multi-instrumentalist Eliyahu Sills. On “Hero’s Return,” for example, Stott interspersed segments of Sills playing bansuri, an Indian bamboo devotional flute, throughout the track. The intense bass line from “Deep Playa” snakes its way throughout Arcana, stopping short of the final track “White Tara.” Compared with his earlier recordings, the powerful sound of Arcana may take some listeners by surprise. Even with the bumpy road Stott encountered before recording the album—or perhaps because of it—Arcana presents a perfect balance of power and peace. It tells the story of coming full circle, and of honoring the past while welcoming the future. Arcana is now available on Six Degrees Records. 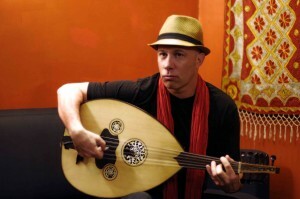 This entry was posted in Review and tagged Electronica, Guitar, Middle East, Oud, San Francisco. Bookmark the permalink.